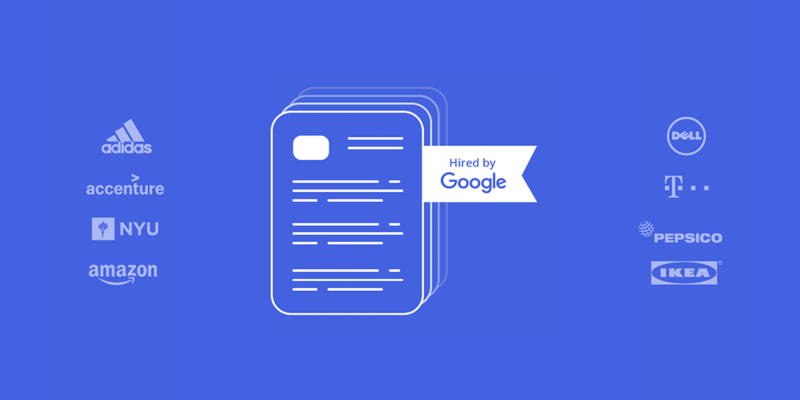 Google receives more than a million resumes every year. Unfortunately, it only hires about four to six thousand candidates. With competition so fierce, it might seem impossible to actually score a job at Google. On the other hand, the most difficult part is to get invited to an interview. Once you make it that far, at least you have some control over how it’s going to go from there. For that reason, we’re bringing you a resume written by someone who already scored a job at Google. Follow in the footsteps of those who already know the way. Everybody hates reading through walls of text. Hiring managers are no different. So don’t waste their time looking for the important information on your resume. Serve it to them straight away! Let them know you understand their priorities. Also, let your resume breathe a little. That will allow the hiring manager navigate through it with ease and find the most important information fast. Finally, you should know that some parts of the resume are fixed, while others will change depending on your particular circumstances. 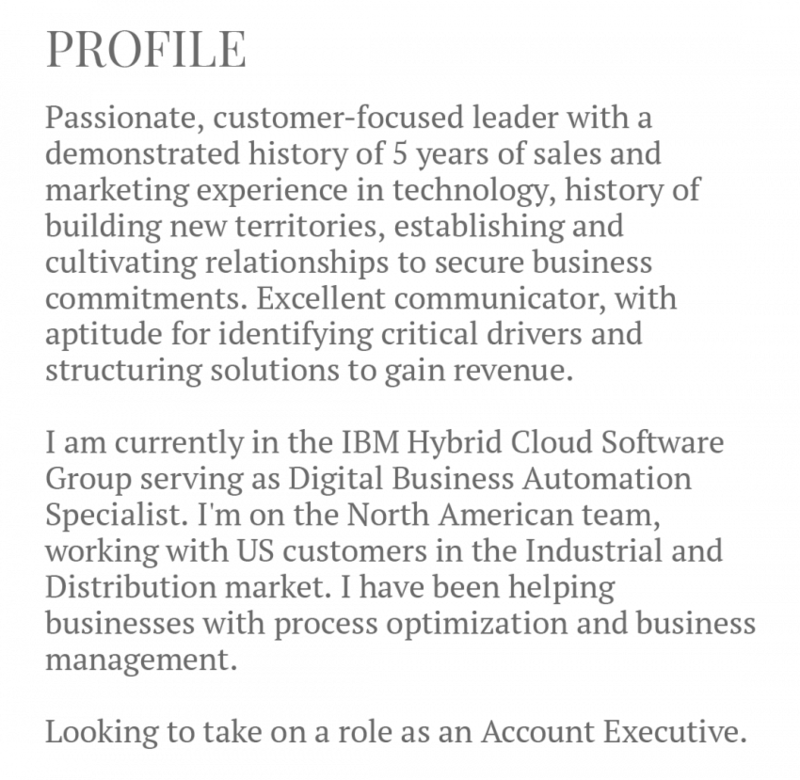 Like Mary in this resume example, you should always keep the contact information at the top so the hiring manager will be able to contact you. Other parts of your resume will depend on your level of seniority. 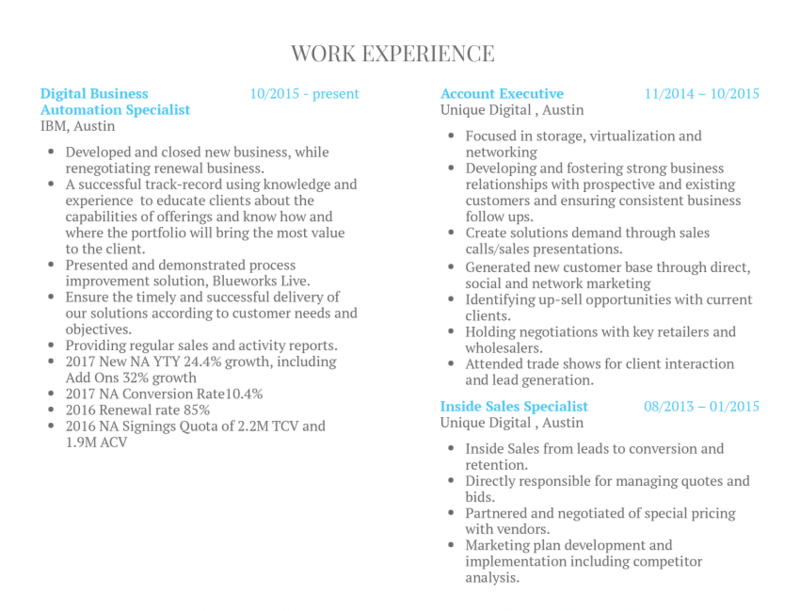 If you’re a fresh graduate, opening your resume with the work experience section is probably not the best idea. Start with education and certificates instead. 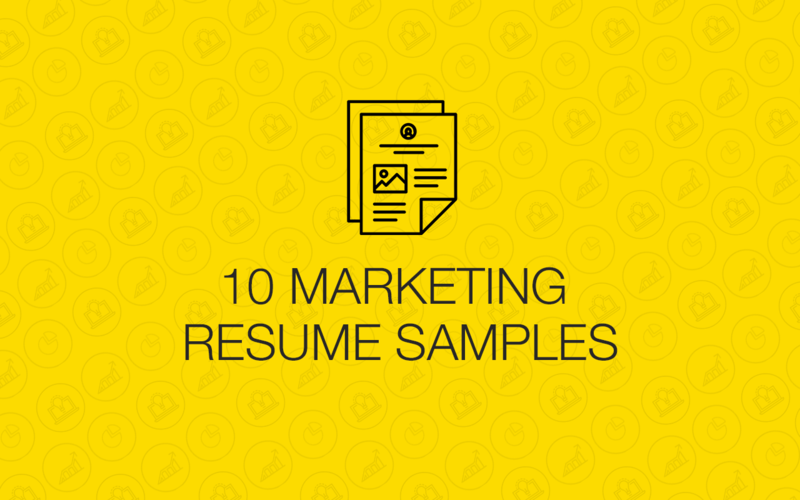 Your resume’s visual side also plays an important role. Maybe use two different colors or replace words with icons. Just remember to do everything in moderation. The first thing you notice here is her name. It’s large a visible and it helps the hiring manager find her resume fast in a pile of others. Right next to it you can find her email address. Email is the primary way of contacting the applicant. Never forget to include it, otherwise they won’t be able to get back to you. Ever. You should always provide your phone number as well. When it comes to your physical mailing address, you don’t have to include it. What about the photo? Is it necessary? Or not? Depends on the country and company culture. When in doubt, don‘t include it. The best way to introduce yourself on a resume is through its profile section. This particular resume does it spectacularly. First, it opens by saying who the candidate is professionally. Second, using the right keywords (based on the job description), it says what the candidate has to offer to a potential employer. Lastly, it states her expectations. She wants to be an account executive. You can go even deeper and explain why you want the position, what are your expectations, what are you excited about it, etc. 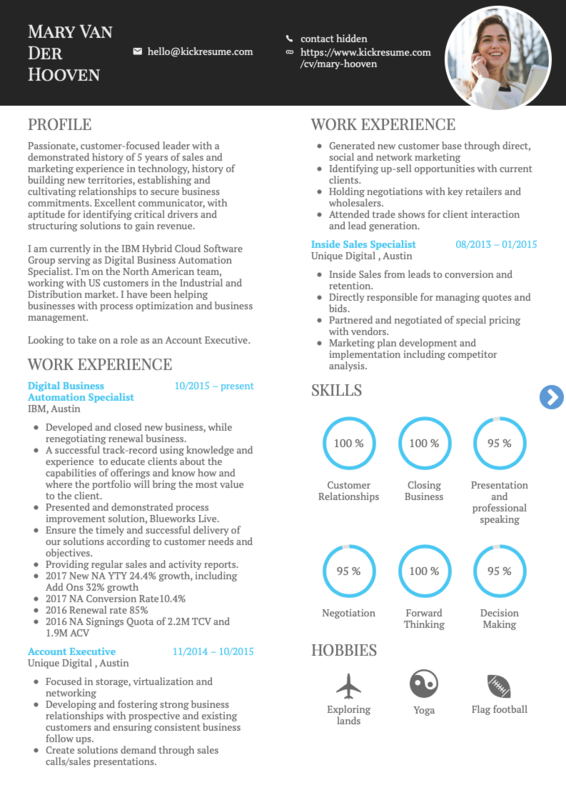 On the other hand, you might also want to keep it a bit shorter than this resume does. It should be a brief introduction, not a full list of your skills and achievements. Nevertheless, this resume scored a job at Google. Who are we to judge, then? Your work experience section is the veritable core of your resume! Because of that, you should put enough effort into writing it. ‘Relevant’ is the word of the day here. No need to list your bartender experience if you’re applying for a dentist job. Stick to the point, like Mary did here. She lists all her duties and daily tasks, summarizing all the details that can resonate with the recruiter. But it’s not only about the words she uses. Those numbers have even greater impact. You might not know what those abbreviations mean but they look good, and anyone from her fields will decipher it in no time. It sends a clear message she’s goal oriented and can back it up with numbers. 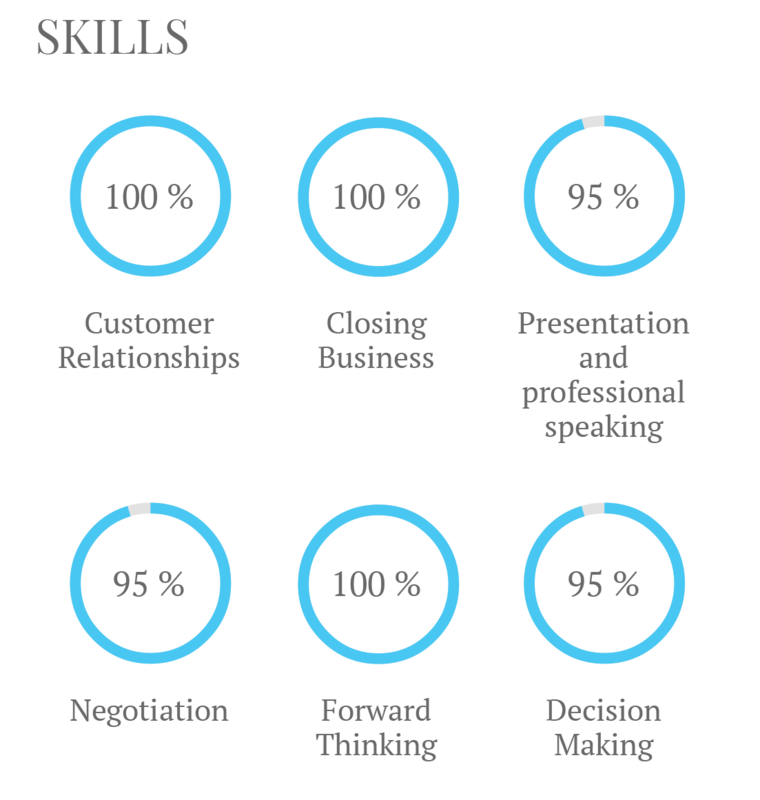 What skills should you mention? Which are redundant? How in-depth should you go? At the same time, avoid using buzzwords. They are the words that have been overused, carry little meaning, and will add nothing to your resume. In other words, anybody can say they’re ‘flexible’, ‘team player’, or ‘outside-the-box thinker’. But what does it really mean? And can they prove it? Nobody knows. Something similar applies to the skills that are indispensable to the job. If you’re a dentist, skills like ‘tooth extraction’ should go without saying. Instead, try to draw the hiring manager’s attention to the skills you have on top of the expected. It‘s always nice to let recruiters know you’re a human being, too. It makes them think of you in a different way. Moreover, if it doesn‘t consist only of the boring ones such as books, traveling, sports, you will rock! Be specific! Don‘t just write sports! 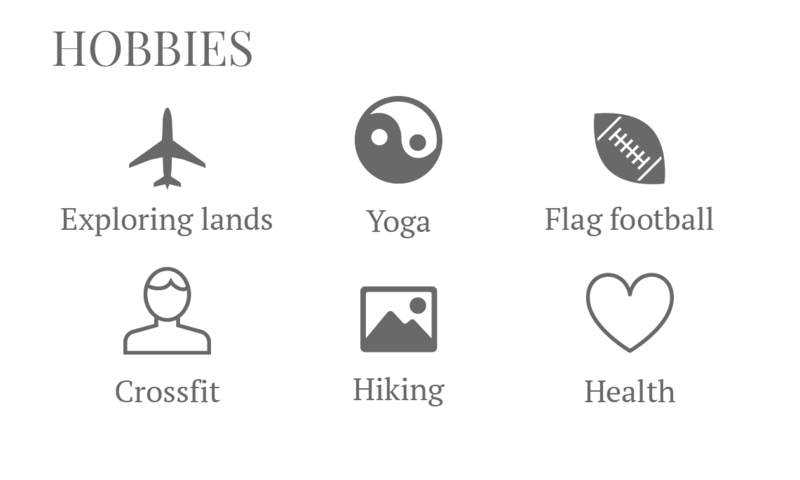 Write yoga, CrossFit, and hiking! Instead of traveling, you’re exploring different lands! The little icons can give it a nice artistic touch, but be careful with them. Sometimes less is more. If you have as many certificates as Mary, don’t be afraid to brag a little. Show yourself in the best possible light, and tell your future employer how eager you are to learn new things. Not only did Mary list her certificates, she also took the effort to explain what kind of skills and knowledge she acquired thanks to them. That’s much more informative than simply listing the certificate. But it‘s not about the quantity only, quality matters, too. Have you ever done a first aid course and got certified? Great. For your loved ones at or anyone around you. Not for the recruiter, at least for the time being. Employers love to see you’re active in non-profits and want to make world a better place. Mary‘s volunteer work backs her skill sets – forward thinking, decision making, communication, negotiation, organization. Everything you need for an executive account job at a big tech company. 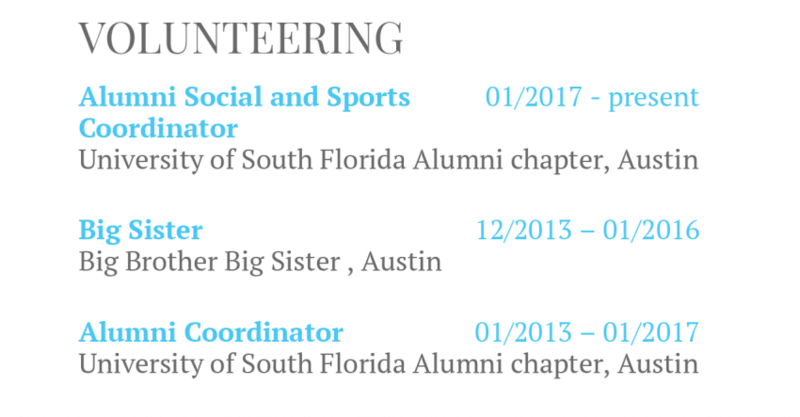 And sports coordinator? Sure, why not! Everybody loves healthy people. Have you noticed? Mary‘s education occupies the last spot on the resume, and it‘s the shortest one. What does it say? 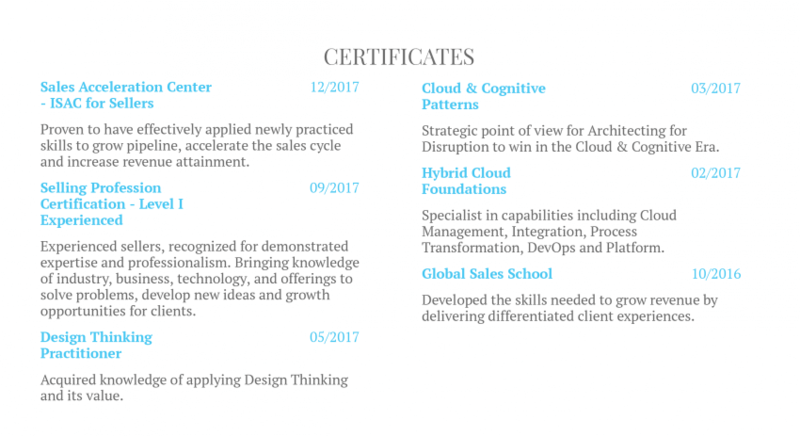 Your experience, proven skills and certificates say more than those few years in college. But all of the above only applies to those who have enough work experience. If you’re a fresh graduate, you want to put your education section first and make it as extensive as possible.